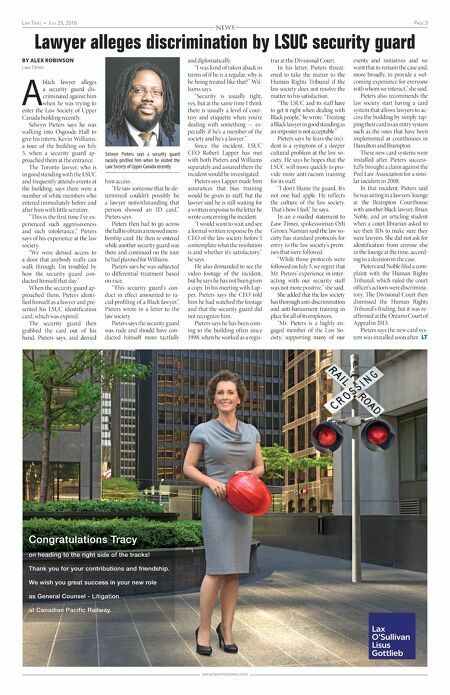 Page 2 July 25, 2016 • law Times www.lawtimesnews.com "Maybe with a new minister, a new attorney general, the time will come where the government will make it clear to Legal Aid Ontario that as a public agency, a government agency, it's unaccept- able to refuse to bargain with their employees." Barrett says LAO has stone- walled the lawyers and refused to even meet with them. Graeme Burk, a spokesman for Legal Aid Ontario, said LAO remains interested in meeting with the group of lawyers to dis- cuss their concerns. "LAO has repeatedly offered to meet and negotiate with an association of staff lawyers," he said in an e-mail. "This would be similar to the manner in which Crown attorneys in Ontario bargain their own professional association with their employer. These offers have been declined." Brendan Crawley, a spokes- man for the Ministry of the At- torney General, said the minis- try is aware of the matter. "Legal Aid Ontario is an in- dependent organization whose management and board of di- rectors are responsible for op- erations and human resources matters," he said in an e-mail. "As this matter is before the court, it would be inappropriate to comment." Three LAO lawyers have also filed a pay equity gap complaint to Ontario's Pay Equity Com- mission on the basis that legal aid lawyers are predominantly female. Their complaint says LAO must conduct a job evalu- ation review that would look at whether its lawyers' pay is in line with that of the lawyers' male counterparts.The Pay Equity Act defines a position as a "female job class" when 60 per cent or more of the people in that posi- tion are female, says Barrett, who is also representing the lawyers on the pay equity action. "Given that the class is now confirmed to be predominately female, [LAO] has to do a gen- der-neutral job evaluation . . . to make sure that the predomi- nantly female lawyers working as duty counsel at LAO are not being underpaid relative to their male comparators," Barrett says. Barrett says a similar com- plaint was previously rejected on the basis that the complainants did not have sufficient evidence to suggest that the staff lawyer position at LAO can be deemed "a female job class" for the pur- pose of the Pay Equity Act. "If the staff were unionized, they'd be entitled to disclose that information, but because LAO has refused to recognize the So- ciety [of Energy Professionals] as their bargaining agent, they weren't able to get the informa- tion they needed," Barrett says. But the information they need- ed has since come from an inter- esting place, the complainants say. When the LAO lawyers launched their Charter challenge in regards to their bargaining rights, former legal aid CEO Bob Ward submit- ted a sworn affidavit in which he "bragged" that by the end of 2015, two-thirds of LAO lawyers were women, says Barrett. "They've now conceded what- ever the pay equity process had earlier determined there wasn't sufficient evidence [to support]," he adds. LAO spokeswoman Feroneh Neil said the figure cited in Ward's affidavit is accurate. But she added that, depending on their call, staff lawyers are paid between $76,000 and $115,000 "irrespective of [their] gender." "In 2015, the Pay Equity Com- mission confirmed that the staff lawyer job class is a gender-neu- tral job class, and found that there was no contravention of the Pay Equity Act," Neil said in an e-mail. LAO staff lawyer Linh Le, who is one of the three com- plainants, says pay equity legis- lation is "meaningless" if it's not enforceable. 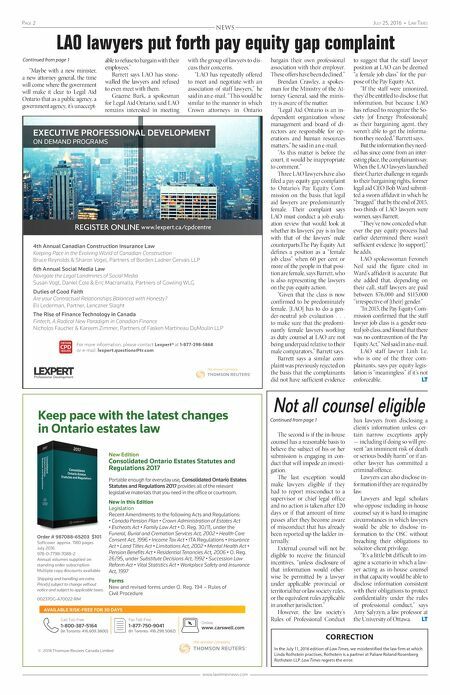 LT NEWS Continued from page 1 LAO lawyers put forth pay equity gap complaint The second is if the in-house counsel has a reasonable basis to believe the subject of his or her submission is engaging in con- duct that will impede an investi- gation. The last exception would make lawyers eligible if they had to report misconduct to a supervisor or chief legal office and no action is taken after 120 days or if that amount of time passes after they become aware of misconduct that has already been reported up the ladder in- ternally. External counsel will not be eligible to receive the financial incentives, "unless disclosure of that information would other- wise be permitted by a lawyer under applicable provincial or territorial bar or law society rules, or the equivalent rules applicable in another jurisdiction." However, the law society's Rules of Professional Conduct ban lawyers from disclosing a client's information unless cer- tain narrow exceptions apply — including if doing so will pre- vent "an imminent risk of death or serious bodily harm" or if an- other lawyer has committed a criminal offence. Lawyers can also disclose in- formation if they are required by law. Lawyers and legal scholars who oppose including in-house counsel say it is hard to imagine circumstances in which lawyers would be able to disclose in- formation to the OSC without breaching their obligations to solicitor-client privilege. "It's a little bit difficult to im- agine a scenario in which a law- yer acting as in-house counsel in that capacity would be able to disclose information consistent with their obligations to protect confidentiality under the rules of professional conduct," says Amy Salyzyn, a law professor at the University of Ottawa. LT Continued from page 1 Not all counsel eligible Keep pace with the latest changes in Ontario estates law New Edition Consolidated Ontario Estates Statutes and Regulations 2017 Portable enough for everyday use, Consolidated Ontario Estates Statutes and Regulations 2017 provides all of the relevant legislative materials that you need in the office or courtroom. New in this Edition Legislation Recent Amendments to the following Acts and Regulations: • Canada Pension Plan • Crown Administration of Estates Act • Escheats Act • Family Law Act • O. Reg. 30/11, under the Funeral, Burial and Cremation Services Act, 2002 • Health Care Consent Act, 1996 • Income Tax Act • ITA Regulations • Insurance Act • Land Titles Act • Limitations Act, 2002 • Mental Health Act • Pension Benefits Act • Residential Tenancies Act, 2006 • O. Reg. 26/95, under Substitute Decisions Act, 1992 • Succession Law Reform Act • Vital Statistics Act • Workplace Safety and Insurance Act, 1997 Forms New and revised forms under O. Reg. 194 – Rules of Civil Procedure Order # 987088-65203 $101 Softcover approx. 1180 pages July 2016 978-0-7798-7088-2 Annual volumes supplied on standing order subscription Multiple copy discounts available Shipping and handling are extra. Price(s) subject to change without notice and subject to applicable taxes. 00237OG-A70022-RM © 2016 Thomson Reuters Canada Limited REGISTER ONLINE www.lexpert.ca/cpdcentre 4th Annual Canadian Construction Insurance Law Keeping Pace in the Evolving World of Canadian Construction Bruce Reynolds & Sharon Vogel, Partners of Borden Ladner Gervais LLP 6th Annual Social Media Law Navigate the Legal Landmines of Social Media Susan Vogt, Daniel Cole & Eric Macramalla, Partners of Gowling WLG Duties of Good Faith Are your Contractual Relationships Balanced with Honesty? Eli Lederman, Partner, Lenczner Slaght The Rise of Finance Technology in Canada Fintech, A Radical New Paradigm in Canadian Finance Nicholos Faucher & Kareem Zimmer, Partners of Fasken Martineau DuMoulin LLP For more information, please contact Lexpert® at 1-877-298-5868 or e-mail: lexpert.questions@tr.com EXECUTIVE PROFESSIONAL DEVELOPMENT ON DEMAND PROGRAMS CORRECTION In the July 11, 2016 edition of Law Times, we misidentified the law firm at which Linda Rothstein practises. Rothstein is a partner at Paliare Roland Rosenberg Rothstein LLP. Law Times regrets the error.